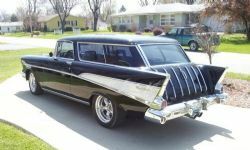 The search is on for a 1957 Chevrolet Nomad. By chance I came across one advertised in Australia, which is the first and last one I have seen advertised locally. 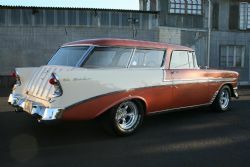 A dealer in South Australia who specialises in importing and reselling classic cars had sourced a Nomad out of Chile. I had to check it out so I made the drive north into the outer suburbs of Adelaide to find a shell, chassis and front seat. It was sitting outside, no glass, in the elements and wet. The story told to me was the car was undergoing a restoration in Chile and the shop that had it went bust and somehow the dealer sourced the car but all the bits were lost. The body had supposedly been stripped and primed but you could see sections where the copious amounts of bog were starting to lift. 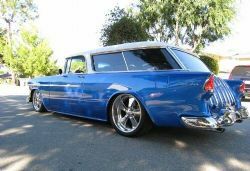 Still, it was a Nomad minus the motor, transmission, lift gate, bumpers and trim and it was already in Australia. I started the process of looking into how much it would cost to source the necessary missing pieces. The good thing about a lot of old American cars is there is a thriving after market for spare parts. Second hand items can be found on eBay, Hemmings and other sites, NOS (new old stock) parts come up occasionally and there are many companies providing reproduction parts made in the USA and Asia. On top of all this there are multiple hot rod shops making improved parts and plenty of chassis builders providing everything from a complete new chassis through to coil over shocks, rack and pinion steering, disk brakes and three and four bar rear ends. The more time you spend on line searching the more options are found. If this isn’t your cup of tea you need only go to your local newsagent, pick up any number of Ford, Mopar or Chevy magazines and the advertisers are lining up to provide you with original equipment spares or the aforementioned resto mod parts. As the parts list for the stripped Nomad started going through the roof so did the cost to replace all the missing bits. At the fifty grand point I stopped, still well short of having everything sourced and priced for the project. I thought that a new bumper at around five hundred dollars wasn’t too bad but because all the bits to attach it were not on the car the ancillary brackets, bolts and bits would add another twenty to thirty percent onto most items. Too hard, too costly, qualify out. I bid on seven cars on eBay over a period of four months. I looked at countless others. I sussed out Hemmings and Old Car Trader regularly, bought books and magazines and boned up on my knowledge. None of my seven bids were successful, although on three occasions I had the top bid but the reserve was not met and the owner wasn’t parting with the car cheaply. A number of outstanding examples came up and sold well under current market value and way cheaper than what it would cost me to restore a car. This again proved to me that if you want to buy a classic car, buy the best one you can as it will always be cheaper than restoring one yourself, unless you can do all the work. My intention is to have the gurus restore it and I know it will cost me more than buying a car already restored but I figure it will be mine and the way I want it to be. If you believe everything you read they made 6,103 Nomads in 1957. Incredibly, the 1957 model was manufactured in ten different assembly plants across America. A lot of people speculate that there would be less than 2,000 left in their ads but judging by the condition of some of the cars advertised people are now digging them out of their back paddocks, pulling them out of barns and trying to sell absolute rubbish for what it would cost to purchase a two to three year old good second hand car in America. I suspect there are quite a few around as there are always ten plus for sale at any one time. Ideally I wanted a California car, from Central valley. Nice dry climate, no snow, no salt water. Anything from the top half of America is pretty much in the snow belt and the use of salt on the roads was very hard on daily driven cars back in this era. California back then was mandating different regulations to the other states, a practice that continues to this day. 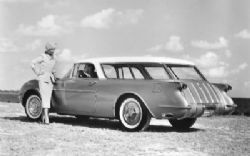 Laws in 1957 required a one piece front bumper for Californian delivered cars whilst other states had a three piece front bumper. Two assembly plants located in California, one in Los Angeles and the other in Oakland, catered for the state wide demand. Another practical reason for a Californian car was the proximity to the port in LA. Most cars after not reaching their reserve on auction sites are relisted. One car of interest was not relisted and after waiting a couple of weeks I thought I would ring the owner and see if he had sold it. One thing led to another and after the mandatory haggling, extra photos that I wanted and some other stuff I had purchased my project car. Because it was going through a full restoration I didn’t bother having someone check it out. The owner sounded very genuine on the phone and did everything I asked. The original spec was for a useable body with minimal rust and most of the trim parts on the car. The owner assured me this was the case. The car I had purchased was not original. Someone had transplanted a 327 into it but it did still have the three on the tree with overdrive. There was no interior in the car, but lots of bits and an interior from a 1956 Nomad supplied with it. Rust free.